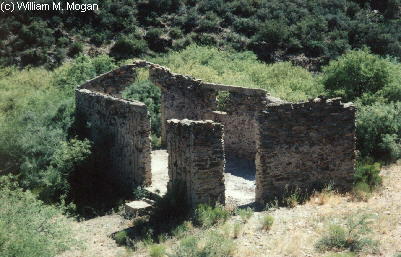 Dispersed ruins can be hard to find at this 1920s town . Destruction of or removal of any artifacts from these sites is a FELONY under the Archaeological Resources Protection Acts of 1979, the Antiquities Act of 1906 and other Federal Laws. Punishment can include fines of up to $100,000 and 10 Years imprisonment. At the state level, a first offense is punishable by fines of up to $150,000 and one and one half years imprisonment as a class 5 FELONY. This includes Metal Detecting and "small souvenirs"
If you don't like this warning - please do not bother to comment. Go to some other website. I couldn't care less about people defending this reprehensible hobby. I am providing this information for entertainment purposes only! I take ABSOLUTELY no responsibility for any loss of any kind, or for stuck, lost, injured, dead or otherwise messed up days, stuff, vehicles or folks. I can also make no guarantee as to the accuracy of the information contained in these pages. These sites are ALL on private property and not all are subject to casual entry.